These two multi-pattern valve mics are contrasted with each other in terms of both sound and design cosmetics. Recently I recorded a large jazz big band in a German recording studio, and got to the point when I had used up all the microphones I knew in the collection. Still in the boxes lay a pair of T-Bone SCT800 valve microphones. Closer inspection revealed that they were in fact a matched pair, so I decided to try them as overheads on the drum kit. Since I hadn't used any T-Bone microphones before I was naturally apprehensive, since they were my last resort in a session that was bursting at the seams with impatient horn players. However, as it turned out I was very pleased with the results, the SCT800 giving a transparent but warm sound with lots of smooth top end. I subsequently used the mics on three further instrumental sessions, (recording piano, brass, BVs, and more drums), mainly because the players I was working with loved the sound of their instruments through these mics. So when the opportunity arose to have a closer look at a couple of other T-Bone mics I didn't hesitate to take it. The T-Bone Retro Tube multi-pattern valve mic. The SCT2000 and Retro Tube are multi-pattern valve microphones at the affordable end of the spectrum. 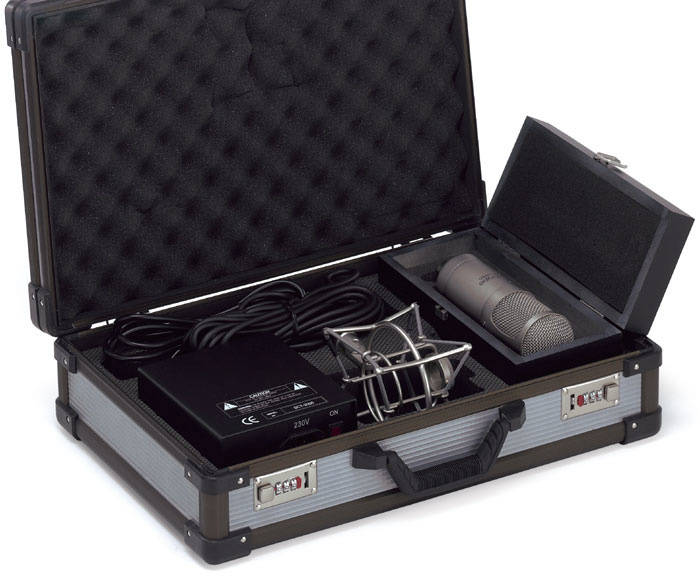 The mics come in padded metal cases including shockmount, cables, and PSU, and both models have very large dual-diaphragm capsules. The SCT2000 is cased in a large metal cylinder and weighs in at a chunky 752g, only to be dwarfed by the square-shaped Retro Tube's 1.3kg. The Retro Tube's unusual design gives an impression of it being larger than life. Looking at the thing you feel like you've been time-warped into a parallel '50s-inspired universe, where the forces of anti-miniaturisation have achieved global supremacy! Back on planet earth, however, this means that these mics look like they are virtually indestructible, with the Retro Tube inherently a little more vulnerable because of the 'bottle'-style design. Obviously you have to handle any large-membrane valve device with care, but they do look solid. Both the T-Bone SCT2000 (shown here) and Retro Tube mics come in a foam-lined case with shockmount, cables, and PSU.Once I got over my initial fear of the unknown, I undid all the screws and had a look at the circuit boards and valve assemblies, which looked clean and well made, while the overall construction was as heavyweight as it appeared from the outside. Both mics have what look like identical gold-plated one-inch-diameter capsules, but come with different PSUs, and also utilise slightly different circuit designs and valves. The preamps for both models have rotary knobs to select the mic response patterns, moving in nine steps from omni, via cardioid, to figure of eight. The SCT2000 and Retro Tube are rated at 130dBSPL and 126dBSPL respectively for 0.5 percent THD at 1kHz, and should be able to handle pretty much anything in the studio. The frequency response diagrams for both mics looked similar as well, with a more or less flat response up to about 5kHz and a slight rise above that, rolling off between 18kHz and 20kHz. Since that means very little, you just have to try them out. Given the weight, I had to find two counterweighted boom stands to mount the mics on, as I wouldn't trust a normal stand with them in anything other than a totally vertical position. The SCT2000 screws into a suspended basket shockmount, while the Retro Tube comes with an attached mounting device isolating the mic from the stand using rubber blocks. This is a method I've not come across so far, but due to the mass and inertia of the casing it works remarkably well. The fact that you are forced to use a serious mic stand also conspires to reduce vibration, and I didn't encounter any problems with mechanical noise. What is, due to size, a little more difficult, is the positioning of the mics, but for most obvious applications such as vocals or brass this presents no problem. More tricky are things like a bass drum in space-confined circumstances, but, let's face it, these mics were designed to impress singers! 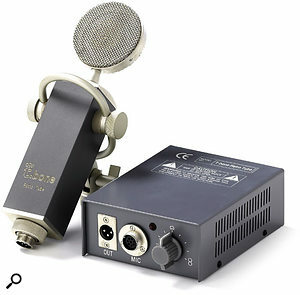 The SCT2000 and Retro Tube occupy a crowded sector of the UK microphone market, which means that there are a number of other affordable multi-pattern tube mics available that you might want to consider — for example the ADK Vintage Valve A48, Rode K2, Studio Projects T3, or SE Electronics Z5600A. However, if you'd prefer something with a bit more visual pizzazz, you might like to check out the distinctly retro-look Sontronics Helios. Being a cynic, I expected both the T-Bone microphones to sound virtually identical, but to my surprise they both had distinctive individual sounds. During the review I set up a simple A/B test to compare them against a known reference, a Neumann U87, and I recorded my own voice and some guitar, percussion, and electric piano with all three, comparing them in the cardioid, figure-of-eight, and omni patterns. In terms of noise and sensitivity there wasn't much difference between the three, although I got 3-4dB more output from the Neumann with identical preamp gain settings. Playing the instruments, I focused on the overall effect the different mic types had on the sounds and performances I recorded. Singing I found easiest on the Retro Tube, and I got some very respectable sounds out of it which would really make me think twice about purchasing a classic microphone about ten times as expensive. The SCT2000 to me sounded more neutral and true than the Retro Tube, with clear and transparent top end and less emphasis in the mid-range — a useful set of attributes when it came to recording a male vocal that was a little edgy in high mid-range. The sound I originally captured with a Neumann KM84 was nice enough, but needed some mid-range taken out with the EQ. When I replaced it for the SCT2000 I got the sound without the EQ, giving a more natural result. I have also used the SCT2000 on brass and electric guitar, whenever I wanted to soften any harshness without losing the higher top end. It complemented the occasional brutal accuracy of other more expensive microphones, such as those from Neumann, AKG, and Schoeps. I found that textural sound recordings like tracked-up backing vocals or double-tracked lead vocals worked well with the SCT2000, because it doesn't add too much character to a sound, but provides a nice round top end. If that sounds a little too subtle for a valve microphone, though, the Retro Tube could be more to your liking. Hand in hand with the striking design goes a sound that has a lot more attitude. You hear more of a 'valve sound', as you might know it from the Antares Mic Modeler, and in a way this mic does the opposite job to the other. It worked really well on a baritone sax soloing over a big-band chorus, adding the edge to the solo that made it stand out. A couple of male singers I worked with also really liked the slight edge it added to their sound. In a nutshell, the difference between these microphones to me is that I use the SCT2000 more to capture a natural sound, when I need high end without piercing aggression. The Retro Tube, on the other hand, lends itself more to situations where you want to create a sound for electric bands and projects in the dance field. It sounds as bold as it looks, and funnily enough looks even better to me now that I've heard it! Well-built valve microphones at a very low cost. The true sound of the SCT2000 complements that of the more gutsy Retro Tube. Quite bulky and heavy, requiring sturdy mic stands. If you're looking for something that can handle a lot of noise while maintaining a nice transparent valve top end, the SCT2000 gives good value for money. For a little more (and cheaper) valve character you can't really go wrong with the Retro Tube, whether you like the cosmetics or not. SCT2000, 298 Euro excluding VAT (approximately £242.13 including VAT). Retro Tube, 245 Euro excluding VAT (approximately £169.47 including VAT). In addition there is a 10 Euro shipping charge to the UK per order.